With improving US economic data, the US central bank (the Fed) is getting ever closer to raising the cash rate for the first time since June 2006. The Fed’s funds rate has been managed in a range of 0-0.25% since the depths of the GFC. The two key determinants in the Fed’s decision to raise rates are the consistent strength in employment data and/or inflationary pressures. Other data such as housing, manufacturing, retail spending, and business and consumer confidence also support that decision making. The US unemployment rate is now down at 5.3% with strong growth in new jobs at around 200,000 per month. We’re also starting to see signs of consistently strong wages growth. Janet Yellen, the Chairwoman of the Fed, recently spoke at two key events and indicated everything was on track for a rate rise this year. She also indicated the Fed was in no rush to raise rates, maintaining that any decisions would be data dependent. 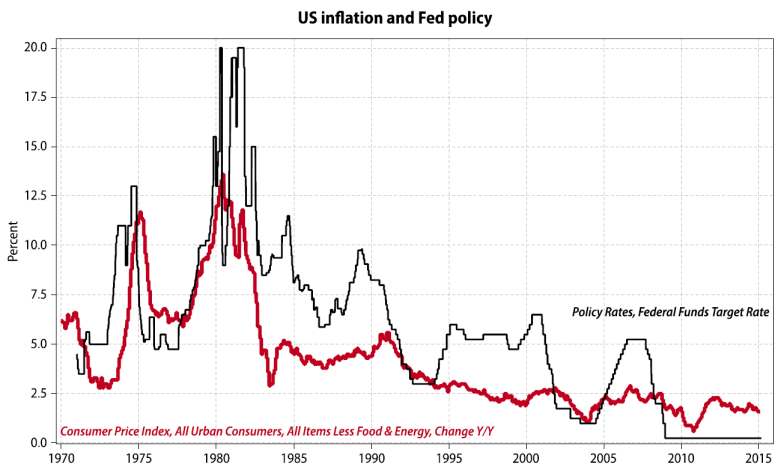 Yellen is previously on record as saying that she doesn’t mind if inflation runs a little higher than has historically been allowed before lifting rates. She would also like to see the underemployment rate fall (i.e. including workers in jobs where skill and pay don’t match their skills and part-time workers who would prefer to be full-time), which would show broader strength in the employment market. Inflation remains well and truly under control at this point in time with falling commodity prices and a rising US dollar. However, any sharp wage increases as the economy pushes closer to full employment could change this. The Fed has meetings followed by press conferences in September and December, where they will want to explain their change in policy. Up until a few months ago, odds were favouring a December rate rise. But recent improvements in data along with Yellen’s recent rhetoric have put September back in the mix. In any case, Fed rate rises from here will be very slow and steady. The last thing the Fed wants is to have to lower the rate not long after raising it. If this was to occur, another round of quantitative easing might be necessary. It would also decimate the confidence the market has in the Fed. As such, we think the Fed will be behind the curve in terms of letting conditions getting ahead of the required interest rate level. In the medium to longer term, we don’t think the Fed will go much higher than 2-2.5% by the end of 2017, given debt levels, demographics and a range of other factors. Rates will be lower for longer. A well flagged September or December rate rise, followed by slow and steady rate rises thereafter, can still result in positive returns from both equities and bonds, and we expect equities to continue to be well supported in the low rate environment. However, it also means likely lower returns from both asset classes going forward. Equity returns consistently above 10% p.a. and bond returns above 5% p.a. are a thing of the past. Interest rate sensitive assets like property and infrastructure may also come under pressure. Rate rises will also put further upward pressure on the US dollar, thus resulting in a lower Australian dollar. Preferred global equity exposure remains unhedged. From the start of 2014, the Chinese stock market rose by more than 140% as investors were driven by momentum and liquidity. The market then fell more than 30%, before recovering some 15% more recently. This was then followed on Monday by the biggest one day fall in more than eight years, with falls likely to continue in the next day or two. China A shares are the local Shanghai and Shenzhen share markets, mostly traded by local Chinese investors, and a limited number of foreign investors who have been granted licences by the Chinese government. The market capitalisation of these two markets totals approximately US$8.5 trillion, making it the second biggest market in the world behind the US. China H shares are the shares of companies incorporated in mainland China (and dual listed on one of the local share markets) that are traded on the Hong Kong stock exchange. As such, foreigners are free to trade them. The Chinese government restricts mainland Chinese people from investing abroad and foreigners (with some exceptions) from investing in A shares. In addition, a lot of Chinese technology stocks are listed in the US as well. The rally was fuelled by millions of ordinary Chinese citizens who opened equity trading accounts to try to make easy money, without necessarily having had access to investment advice. In addition, relaxed lending rules, helped by rate cuts, meant that a lot of the shares were purchased on margin (i.e. with the use of leverage). Economic reforms from the government and very low valuations before the rally also assisted in fuelling investors to shift speculative money from real estate to shares. 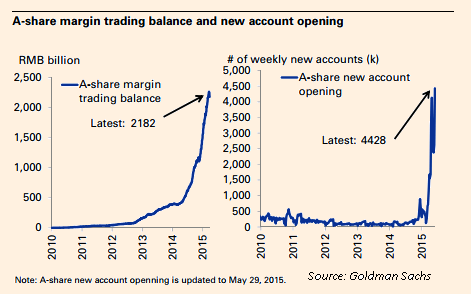 In April and May alone, more than 14 million retail trading accounts were opened. The reasons for the market fall aren’t so clear – Chinese investors are notoriously momentum traders; tight liquidity brought by seasonal cash hoarding and a long list of IPOs; regulators’ scrutiny on margin financing – are just some of the possible explanations. 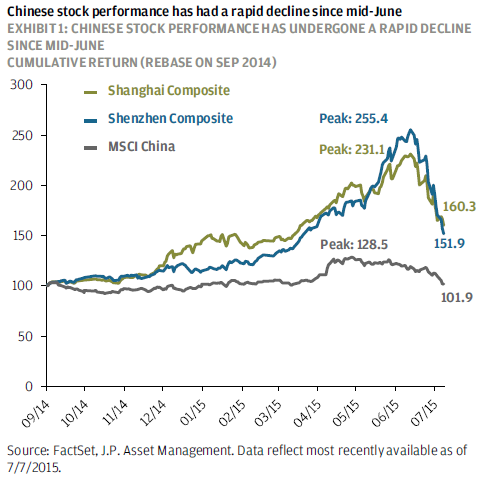 As the market fell, Chinese authorities stepped in to try to stem the losses. They pumped fresh liquidity into the market, suspended IPOs, banned short selling (i.e. investigated those that were undertaking it), froze trading in some stocks (1,400 to be precise), relaxed rules on margin calls, ordered stock brokers to start buying stocks, and provided additional capital to the country’s largest banks. However, this action can create unintended consequences, as we saw the market fall more than 8% on Monday, most probably the result of pent up selling and profit-taking pressure, as government bans were lifted and frozen stocks began trading again. Investors may have also lost faith in the government’s ability to stabilise the market. Whilst the damage (and gain before that) has been limited to local Chinese investors, the current bear market has resulted in wealth destruction (there are some 90 million retail investors), debt overhang and bankruptcies, which will hamper an already slowing Chinese economy. The extent of which is unknown at present, but likely to be small in the scheme of things. Confidence and sentiment are a different thing altogether. This has led to commodity prices falling sharply more recently as the spotlight moves from Greece back to China’s slowing economy, with questions being raised as to China’s future demand for commodities. to propel the market higher as the government looks to sell-off equity in state owned companies over the next few years as part of their moves to liberalise the economy. Most Australian investors will have little to no exposure to China A shares. However, some may have exposure to China H shares, which didn’t rise nor fall anywhere near the levels seen by A shares. The recent falls mean that Chinese equities now look much better value than they did before, but volatility will persist whilst the market develops and the government liberalises the economy. The preferred approach to playing China should always be through a diversified, actively managed, broader Asian share fund. The effects on commodity prices will be short-lived given the share market fall bears little relationship to demand for commodities. This may present a buying opportunity for the Australian majors. If you wish to discuss any of the above or your current situation/portfolio, please don’t hesitate to contact us on 02 9324 8888 or book an appointment today.